While attending Lamar University, Paul Fregia had his eyes set on a career as an electrical engineer, but in the long run, it wouldn’t be computers or electronics that he would be creating — he would instead concoct tasty recipes in the kitchen that summon childhood memories. 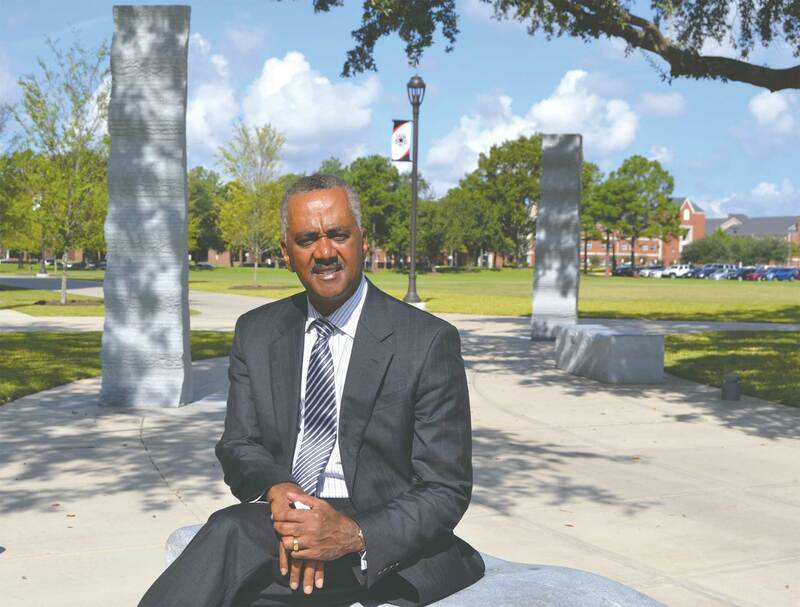 Photo by Kevin King – Paul Fregia on the campus of Lamar University. While Fregia holds a degree in Electrical Engineering from Lamar University, his true love is his company, Grandma Maud’s Down Home Cookin’. While Fregia holds a degree in Electrical Engineering from Lamar University, his true love is his company, Grandma Maud’s Down Home Cookin’. “I’ve often been referred to as the engineer who went from making electronic chips to chocolate chips,” Fregia said. Fregia grew up in Beaumont, where he learned to appreciate the wonderful food his maternal grandmother Maud simmered, stirred and served from her kitchen. His fondness for southern-style comfort food has helped drive his authentic flavors. Although his mother died when he was 7, he had a strong mother figure in his grandmother, Grandma Maud. His grandmother’s southern cooking meant more than a meal to him, he said. It was a way of showing affection and would later inspire his business venture. Fregia, however, would first go to work. He gained the knowledge of the business side of the food industry after graduating with an MBA from the Krannert Graduate School of Management at Purdue University and going to work at a national supplier. He worked for the tea supplier for McDonald’s for more than a decade, and also held management positions with Container Corporation and Hewlett-Packard. While working as a product consultant, Fregia learned the ins and outs of product development but discovered “everybody made a lot of money but me.” He decided to put his skills in product design and development to work for himself. After years in management, developing products for companies with national customers like McDonald’s, Fregia created a food line to meet the public demand for southern cuisine. His products help consumers quickly replicate flavors that can take southern cooks hours to create. With an engineer’s process-oriented approach, he set out to design a product within a given budget that would perform well. Performance was based on flavor and cooking time. The challenge: to develop authentic southern flavor in a mix and make it quick and easy to prepare. “All a customer had to do was add three cups of water, and it would be ready in 25 minutes,” he said. In 1994, he founded his Chicago-based company Grandma Maud’s Inc., as a tribute to his grandmother. Although she didn’t live to see the company or taste its products, her legacy lives on. One of the reasons his product is so successful is because he draws on the tastes of his childhood. Fregia said he often remembers as a boy the succulent taste of ham-hock and has used it as a way to bring out flavor in his dishes. “That ham-hock flavor became so popular among some of my customers that I decided to bring it to market by itself,” Fregia said. In fact, probably his most popular product, according to Fregia, is his Southern Seasoning, which blends spices and flavors built on the southern tradition of adding that smoked ham-hock meaty flavor. “We’ve since expanded and have other flavors, but that was the inspiration to bring some southern tasting foods to regions of the country that don’t have that,” Fregia said. The company’s products include its Bean Meals mixes, Southern Seasoning, sweet potato Pie Fixin’s, cookies and frozen ready-to-serve entrees and side dishes. Lamar students, faculty and visitors to the university’s dining hall can now enjoy three different kinds of cookies from Grandma Maud’s kitchen — Lemon White Chocolate, Chocolate Chip with Candy Pieces and Chocolate Chip. Not only are the cookies delicious, they also show that a graduate of Lamar, with an entrepreneurial spirit, can go on to achieve great things, said Candace Gracik, senior director for Chartwells for Lamar University. Gracik said Chartwells is also considering bringing in Grandma Maud’s muffins and his Southern Barbecue Sauce to use at Tiny House BBQ, which is located on the Lamar campus. Supporting vendors with local ties like Fregia’s company is important, Gracik said. “I think it adds connections and it builds the community as a whole. It creates a foundation of success,” she said. Fregia, who served as business confidant to golfer Tiger Woods and his family for more than five years and is the founding executive director of the Tiger Woods Foundation, also helped established a support group that would give minority students an opportunity to study together by starting a Lamar chapter of the National Society of Black Engineers. In 2003, Maud’s became one of the first African-American companies to sell products nationally through Safeway. Fregia currently serves on Lamar University’s College of Business Board of Advisors. Fregia also said he is considering investments and business ventures in Beaumont that he hopes will create jobs in the area. Grandma Maud’s products are available at grandmamauds.com. — Chris Castillo contributed to this article.